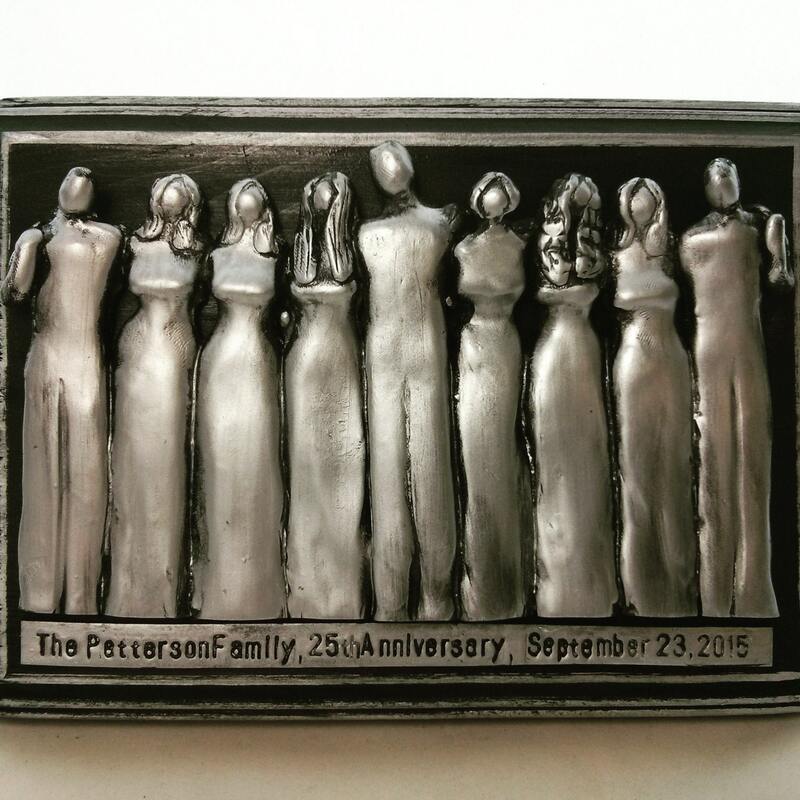 25 Year Anniversary Family Portrait Plaque. 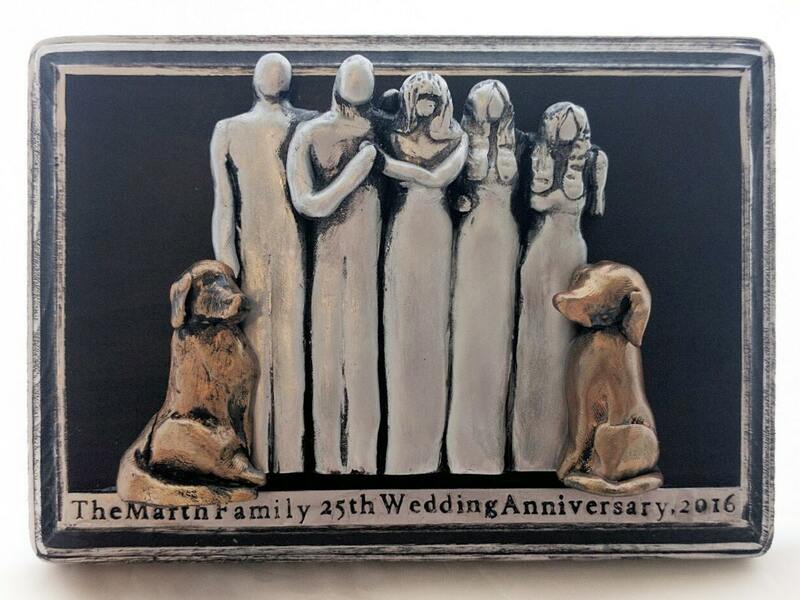 Celebrate the 25th anniversary with a custom personalized silver family portrait a plaque that represents the couple's family! When you make your purchase, simply tell me in the "note to seller" section your family's name, if you have any children and their sizes - or better yet, send me a photo! Be sure to tell me the words you want engraved on the name plate. Also, note if there is a delivery date you hope to receive the anniversary gift by. Please contact me first to confirm that I can create your custom 25th anniversary gift in time especially if it is during the holiday season. All plaques are shipped via Priority Mail within the US. Because you are purchasing a custom 25th anniversary gift for your wedding, I need a few weeks depending on my schedule to create it. Please feel free to contact me if you have any questions or a new idea for your silver 25th wedding anniversary gift! 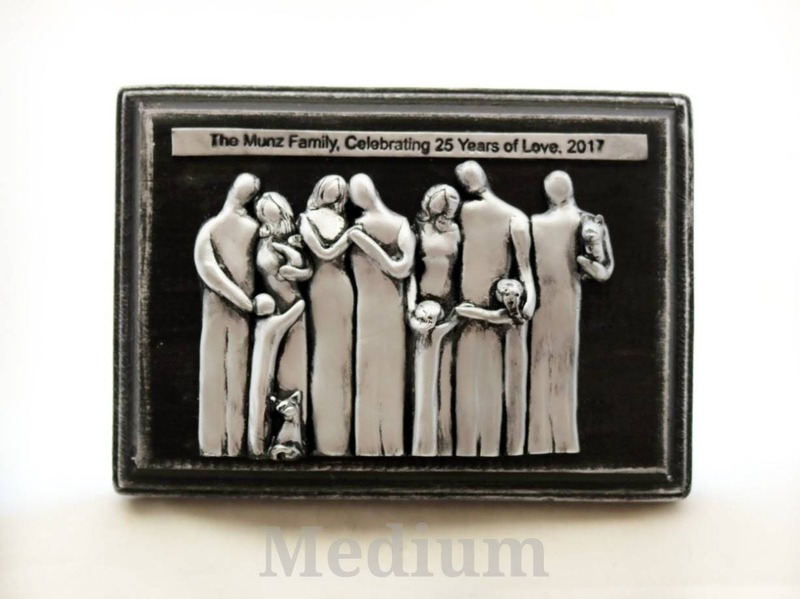 This is a personalized family portrait that makes a unique 25th Silver Wedding Anniversary gift for your husband, gift for your wife or a special gift for your parents. 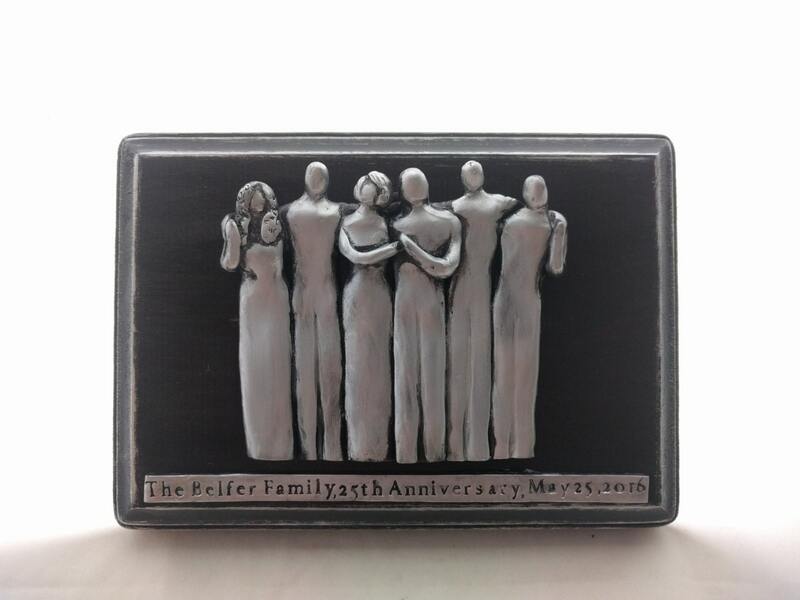 Each Silver 25th Anniversary Gift Plaque is custom made, includes a 3D family portrait sculpted out of polymer clay, rubbed with silver metal powders and sealed with a clear glaze. The personalized text for these anniversary gift plaques are hand stamped with any message you like. The wood for the anniversary gift plaques are painted with black acrylic paint and come in two sizes, 5" x7" or 8"x10". As you check out, you must leave me the details of the family I am to sculpt for the anniversary plaque. If you can send a photo that would be ideal! I also will need to know the text you want engraved of the plaque. Because this anniversary wall art is custom made, I require several weeks. Please feel free to contact me if you have an anniversary date approaching soon and I will see if I can rush your order.